Have you heard of Cowboy Caviar? 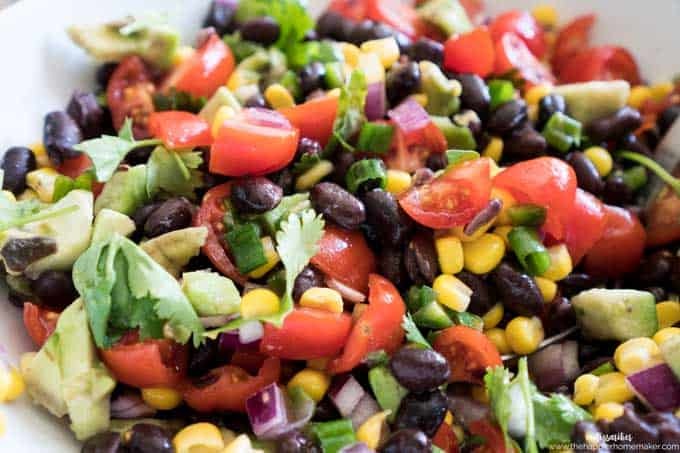 It seems to me that it goes by a ton of different names: Black Bean & Corn Salad, Cowboy Salsa, Black Bean Salsa, the list goes on! No matter what you call it, this delicious dish of black beans, corn, cherry tomatoes, and other goodies is always a crowd pleaser! Did you know that 84% of Americans have experienced a “snack regret” – eating a snack that leaves you hungry and unsatisfied and makes you feel unhealthy? That’s no fun! That’s part of the reason I am loving keeping some yummy Cowboy Caviar at the ready in my fridge this summer. It’s a filling, tasty, and no-guilt snack! Like I mentioned I usually have a container of the Cowboy Caviar made up in the fridge-it lasts about three days (if it doesn’t get eaten up first!) and tastes delicious cold so it’s a great snack. It’s also a HUGE hit when entertaining and can be prepped ahead of time. 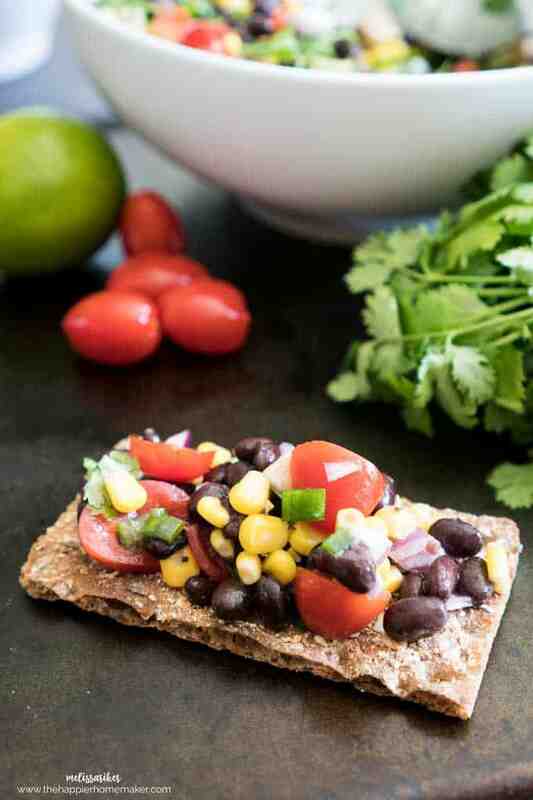 Create a delicious and colorful snack by throwing together an easy bowl of Cowboy Caviar – a black bean and corn salad perfectly flavored with cilantro and lime! In a medium bowl combine all ingredients except avocado. Stir to coat and refrigerate for at least 30 minutes. Add avocado and serve. Can be kept in the refrigerator up to three days. Yum! 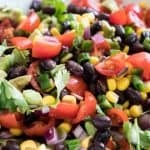 This recipe reminds me of a black bean, corn and avocado salad that I make. I need to make this, the name alone is super cute. Thanks for sharing. We eat Wasa crackers almost every day. This recipe looks great! I look forward to trying the Wasa crackers. These crackers look so good and our family is always looking for good crackers. My version is called Texas Cavier but doesn’t have avocado or lime juice in it. I am interested in trying your version. I usually serve it with corn chips but will try some Wasa crackers the next time I go to the store. They look like they might be good with cottage cheese as well. I cannot remember if I have ever tried these, but I do know of them and they seem like they would be great with the Cowboy caviar too! Thanks so much for the chances to win. I have tried Wasa Crackers and like them. I bought some around Christmas time and set them out during our festivities with hummus spread. Thank you! Yum, I love Wasa! The cowboy caviar looks delicious, I can’t wait to try them together. I would love to try these. Your recipes looks so good. I stumbled upon your recipe here googling cowboy caviar for July 4th! I wanted something heartier that could also double as a quasi-meal for vegetarian guests. This fits This fits the bill PERFECTLY thanks to the crispbread addition. I have found a winner and new blog to add to my list. Thank you!!!! YUM! Wasa Crackers have been a staple in our household (since I was quite young) for as long as I can remember! Always so crispy and very flavorful. Your recipe looks great and is on my ‘must try’ list for this summer. Thanks for the great recipe and the fabulous giveaway! Thanks so much for sharing, we’ve made this a few times now and it’s a must for entertaining in the summer!! This is a great recipe, I’ve made it so many times, thanks!